I think everyone struggles to be truly content. Whether in possessions, circumstances, relationships, or something else, we all answer like Rockefeller when he was asked how much money is enough: “just a little bit more.” Contentment is a battle for everyone. 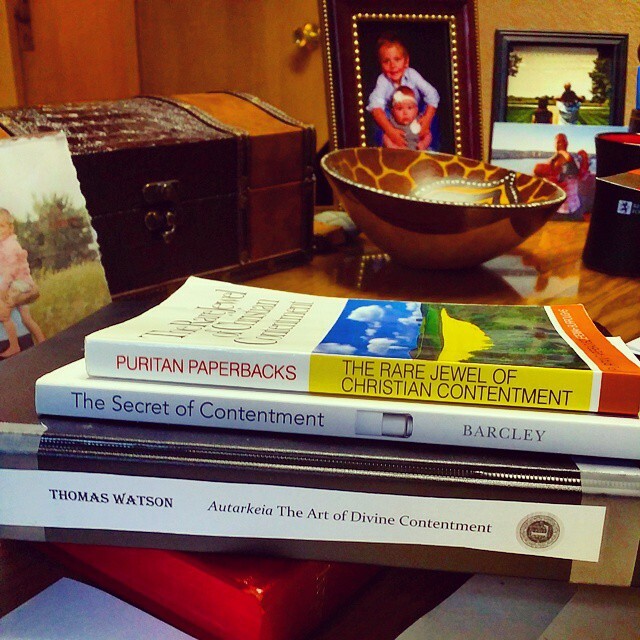 I recently preached on contentment, and I had three resources that were of great help to me. The following books are often missed by Christians, and I hope you’ll take note of these. Jeremiah Burrough’s The Rare Jewel of Christian Contentment (Amazon), William Barcley’s The Secret of Contentment (Amazon), and Thomas Watson’s The Art of Divine Contentment (Amazon paperback, CCEL, PDF) are all masterful treatments of a subject that many modern Christians are deficient in. And last, though certainly not least, I was greatly helped by these godly women – Jen Wilkin, Nancy Guthrie, and Melissa Kruger – discussing contentment for TGC. I pray their discussion helps you also. This entry was posted in ministry, posts and tagged Burroughs, contentment, Philippians 4, piety, sanctification, TGC, Thomas Watson by blund. Bookmark the permalink.